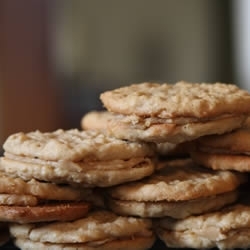 I have more than just an oatmeal peanut butter cookie recipe, check out more recipes at the end of the page. Who doesn't love the peanut butter/chocolate combo? No chocolate for dipping? Make them anyway because they taste like gourmet Nutter Butters. This is my go-to cookie for showing off and sometimes I dip them in melted chocolate. Who doesn't love the peanut butter/chocolate combo? Without chocolate they taste like gourmet Nutter Butters. PREHEAT oven to 350 degrees and butter (or lightly spray) cookie sheets. In a large bowl, cream together 1/2 cup butter or margarine, 1/2 cup peanut butter, white sugar, brown sugar, and vanilla. Add egg and beat well. In another bowl, combine the flour, baking soda, baking powder, and salt. Divide dry ingredients into thirds and add each third to the creamed mixture and beat after each addition. Add oatmeal and mix well. Drop by teaspoons onto greased baking sheet, and press each mound down with a fork to form 1/4 inch thick cookies. Bake for 10 minutes, or until cookies are a light brown. Cream 3 tablespoons butter or margarine with the powdered sugar, smooth peanut butter, and cream. Spread filling onto half of the cooled cookies, then top with the other half to form sandwiches.